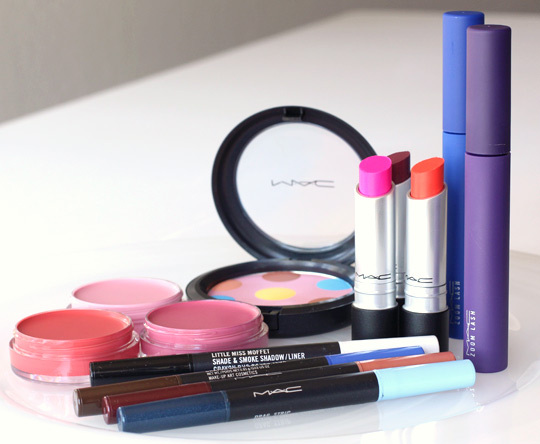 MAC Beth Ditto and Casual Colour Collections: A Quick Look! Just a couple pics of some makeup from the MAC Beth Ditto and Casual Colour Collections, now online at maccosmetics.com. Both collections dot MAC counters and stores in North America next Thursday, June 7.
International gals, look for MAC Beth Ditto at MAC counters and stores in June; Casual Colour also arrives in June, but at select MAC locations only. More in just a few! Exciting! Can’t wait to see both bright lip colours on you Karen! I bet they look great on you! Oooh. I want to see how the colored mascaras perform! Can’t wait to see your swatches! The collection comes out here in Belgium this Saturday. I’m really hoping I’ll see some swatches before deciding what (or whether) to buy! Oh, I can’t wait for your searches. I’m so curious about this beauty powder. I’m working on them right now. The Beauty Powder is … interesting, LOL! OMG OMG OMG…The colors are soooo bold!!! Im ready to see how the powder looks..lol was it what you expected?? It’s definitely different lol can’t wait to see!! I like the look of the coral/rosy coloured pot and the thing with dots! EEEK!!!! I’m really excited for these! I can’t wait to try them all out! KandyKay recently posted … May 2012 Favorites! Ooooh! pretty! fun colors of summer. 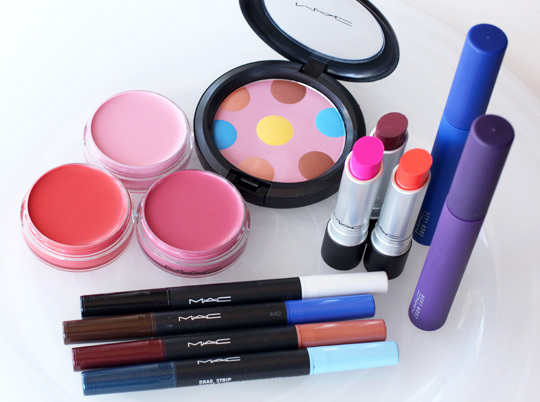 I cant wait to get my hands on that orange lipstick. hmmm,,, I wonder if it matches my dark undertone? I love these previews. Wow the colour combination is (crazy!) great!! I ordered the powder at like 2 am Thursday during an unexpected insomnia attack. 😛 The things lack of sleep make me do…. LOL, yeah, I was wondering what was going on the other night when we were chatting. My insomnia has been the WORST lately too. El Hub’s snoring is not helping. When do you get your powder? Today, supposedly since there was a free 2 day ship code. The UPS man hasnt been by yet but im waitinggg!